Hi. This is one of my projects now. 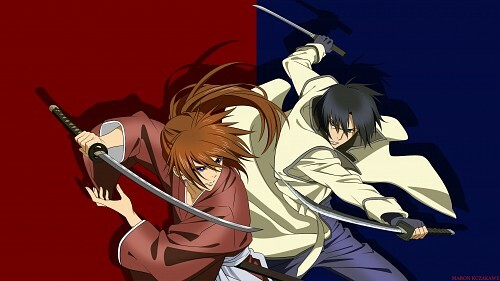 Have to do two more walls for Kenshin and than i will rework my old wallpapers. My main plan is improve my lineart on this walls so i hope its better and better. This wall is very simple. I do it for my own destop, so the bg is just the colors and simple shadow. I hope it will be ok. The basic lineart is from Ilustrator and the colors, shadows and bg from photoshop. I try to do the characters exactly as the original version so i hope its ok.
Now I would just say to make your base color layers within lines, because there are tons of color bleed, since lines are not even and thin you need to make base color shapes very proper so the color won't step out from lines.